Code the Future connects developers with educators to help students learn how to code. They are presenting at a Meetup session and they are looking forward to sharing some amazing stories from their community and projects. 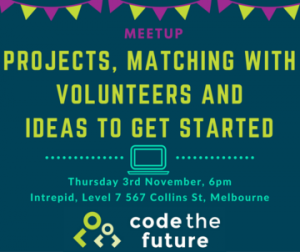 You can always get in touch with Bec, Will & the Code the Future Team through the group profile on Meetup. Don’t forget to RSVP. See you there.